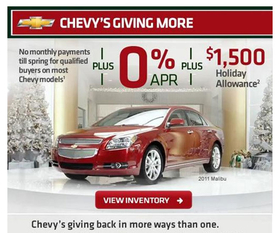 Black Friday deals such as this ad from Chevy brought buyers into the showrooms over the Thanksgiving weekend. DETROIT (Bloomberg) -- Consumers who set records for retail purchases during Thanksgiving weekend helped boost U.S. auto sales in November, which may have run at the fastest pace in more than two years. Light-vehicle sales in November, to be released tomorrow, may have run at a 13.4 million seasonally adjusted annual rate, the average of 14 analysts surveyed by Bloomberg. That would top the 12.3 million pace of a year earlier and October's 13.3 million rate, which was the best month since sales were helped by "cash for clunkers" in August 2009. Consumers spent a record $52.4 billion during the holiday weekend, excluding autos, according to the National Retail Federation. General Motors Co. put a Santa Claus look-a-like in its "Chevy's Giving More" ads, while Honda Motor Co. wished buyers "Happy Honda Days" with zero due at lease signing, enticing buyers who have deferred auto purchases. "The automakers are sending the consumer buying signals right now," Jessica Caldwell, an analyst for researcher Edmunds.com, said Tuesday in a conference call. "The year-end sales, Thanksgiving sales, Black Friday sales, holiday sales, whatever it is, there's some sort of sale out there. It makes sense for consumers that if now is the time to buy something, from jewelry, to a flat-screen TV, it must also be a good time to get a deal on a car, too." Analysts at Jefferies Inc., IHS Automotive and TrueCar.com may now increase their estimates for 2012 deliveries as Toyota Motor Corp. and Honda production recovers from natural disasters in Japan and Thailand. Demand is improving even as automakers maintain discipline by limiting incentives, they said. "Underlying consumer demand is stable and we may have hit a bottom in terms of minimum level of sales that the industry will continue to carry going into 2012," Jesse Toprak, an analyst for TrueCar.com, said in a phone interview. "Even though the stock market, housing market and consumer confidence all have been down or extremely volatile the last few months, new-car sales stood steady and in fact inched up a couple of notches." Consumer confidence surged in November by the most in more than eight years, The Conference Board's monthly index showed yesterday. The percentage of consumers planning to buy a new vehicle within six months climbed to 4.1 percent, the highest since April, the New York-based private research group said. The pace of U.S. auto sales had dropped below a 12 million rate in May and June after the March 11 earthquake and tsunami in their home country disrupted parts supply and production for Toyota City, Japan-based Toyota and Tokyo-based Honda. The auto-sales rate stayed below 12.3 million in July and August. The slow recovery prompted analysts to cut their estimates for next year to 13.5 million light-vehicle sales, the average of 14 estimates compiled by Bloomberg. The average was more than 14.2 million before Japan's tsunami hurt supply. "We're bottoming," George Magliano, an economist at IHS Automotive, said of his firm's estimate for next year, which was reduced to 13.2 million. "We're looking at the strong month we expect for November and feeling better about where we're going to go with auto sales." Toyota may say deliveries rose 5 percent from a year earlier, and Honda sales may climb 2.6 percent, according to the average estimates of five analysts surveyed by Bloomberg. Both automakers have reported year-over-year declines in every month since April. "Several high-volume launches, such as the Camry for Toyota, should support continued strength in auto sales into 2012," Peter Nesvold, an analyst for Jefferies, wrote in a Nov. 25 research note. Jefferies sees "upward pressure" to its 2012 sales estimate of 12.7 million, which was reduced from 13.6 million in August, he said. Chrysler may lead all major automakers with a 37 percent surge in sales from a year earlier, the average of eight analysts' estimates. The automaker is boosting sales even as it reduces deliveries to fleet customers such as rental-car companies, said Alan Baum, principal of Baum & Associates. "Their retail volume a year ago was dreadful," Baum said in a phone interview. Ford deliveries may climb 10 percent, the average of eight estimates. The automaker's performance is "encouraging" because it precedes Ford's introduction of a new Escape sport-utility vehicle, which may boost sales when it goes on sale in the first half of next year, Itay Michaeli, an analyst for Citigroup, wrote in a Nov. 21 report. "November was a good retail environment for consumers overall," Erich Merkle, Ford's sales analyst, said Tuesday in an interview. Consumers have been "sitting on the sidelines for quite some time. Black Friday provided that reason to get out there." GM may say deliveries increased by 7.4 percent, the average of eight estimates. Don Johnson, vice president of U.S. sales, forecast at a Nov. 15 investor conference that the industry would get close to a 14 million sales rate, including medium-and heavy-duty truck deliveries. GM is poised to replace Toyota as the world's largest automaker by vehicle sales. Hyundai Motor Co. and its affiliate Kia Motors Corp. may combine to sell 24 percent more vehicles than a year earlier, according to the average of three estimates. Nissan Motor Co. may say deliveries climbed 12 percent in November, the average of five estimates. Industrywide car inventory rebounded to 53 days supply at the beginning of November, from 43 days a month earlier, according to LMC Automotive. That's the biggest sequential increase since February, Jeff Schuster, an analyst for LMC, said in an e-mail. Toyota and Honda have said production cuts that followed floods in Thailand will be less severe than the companies feared. Toyota said Nov. 23 that North American factories will operate on normal schedules this week and next week, including overtime. Honda said Nov. 28 that six plants in the U.S. and Canada will resume normal output Dec. 1. "We are really starting to see pent-up demand dig in," Jim Lentz, president of Toyota's U.S. sales unit, said in a Nov. 17 phone interview from Blue Springs, Miss., where the company opened a plant to build Corolla compact cars. "It's starting to push industry sales regardless of whether the economy is flat or going up."